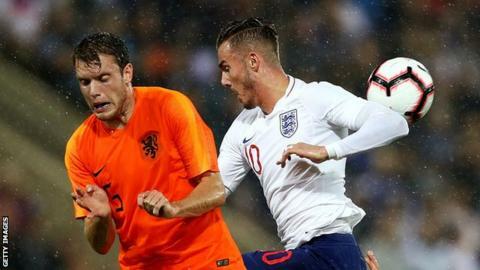 England Under-21s kept control of European Championship qualifying Group 4 but were left frustrated after being held to a goalless draw by Netherlands. Aidy Boothroyd's side had the greater number of clear-cut chances at Carrow Road but failed to make them count. Dominic Calvert-Lewin twice saw efforts saved and Demarai Gray curled a shot against the crossbar. The draw preserves England's unbeaten status in qualifying and their five-point advantage over the Dutch. With three games remaining, the first of which is in Latvia on Tuesday, Boothroyd's side are favourites to go through to the Euro finals in Italy next June. The Netherlands' failure to win gives encouragement to Scotland, who are now just a point behind the Dutch following a 3-0 win over Andorra on Thursday. Both teams in Norwich looked good going forward, but neither were assured at the back, with England struggling to fully get to grips with an initial 3-4-3 formation that mirrored the senior side to the extent that one third of the back-line was comprised of an attacking full-back in Leicester's Ben Chilwell. They would revert to a more familiar and robust back four after 30 minutes but before this early teething problems saw the Netherlands find acres of space in the box, with only Guus Til's wildly-high shot saving the home side. At the other end, Everton forward Calvert-Lewin, Gray and the latter's Leicester team-mate James Maddison were particularly lively. The first spurned two chances within the opening two minutes - the second the best of them when he was clear through on goal - as both were saved by Justin Bijlow. Maddison, returning to Carrow Road for the first time since his summer move from Norwich to Leicester, was England's chief creative force for the 75 minutes he was on the pitch and it was only down to some disciplined Dutch defending that he was unable to find the space he needed. Gray brought his superb Premier League form into the game with a number of driving runs down the right and by fizzing, dangerous crosses into the middle. He was a yard away from opening the scoring with a deflected shot from 25 yards early in the second half. He went even closer later in the half when he cut inside from the left before unleashing an effort from just inside the box that came back off the woodwork. Match ends, England U21 0, Netherlands U21 0. Second Half ends, England U21 0, Netherlands U21 0. Attempt missed. Tom Davies (England U21) right footed shot from the centre of the box is too high. Attempt blocked. Tom Davies (England U21) right footed shot from the centre of the box is blocked. Corner, Netherlands U21. Conceded by Dean Henderson. Attempt saved. Pablo Rosario (Netherlands U21) right footed shot from outside the box is saved in the top centre of the goal. Assisted by Sam Lammers. Corner, Netherlands U21. Conceded by Ezri Konsa Ngoyo. Corner, England U21. Conceded by Pablo Rosario. Attempt blocked. Demarai Gray (England U21) right footed shot from outside the box is blocked. Assisted by Tom Davies. Carel Eiting (Netherlands U21) is shown the yellow card for a bad foul. Ezri Konsa Ngoyo (England U21) wins a free kick in the attacking half. Foul by Carel Eiting (Netherlands U21). Demarai Gray (England U21) hits the bar with a right footed shot from the left side of the box. Assisted by Lewis Cook. Ben Chilwell (England U21) wins a free kick on the left wing. Foul by Bart Ramselaar (Netherlands U21). Substitution, Netherlands U21. Bart Ramselaar replaces Arnaut Danjuma. Substitution, England U21. Tammy Abraham replaces Dominic Calvert-Lewin. Substitution, England U21. Dominic Solanke replaces James Maddison. Donyell Malen (Netherlands U21) wins a free kick in the defensive half. Attempt missed. Ben Chilwell (England U21) left footed shot from outside the box misses to the right following a corner. Corner, England U21. Conceded by Denzel Dumfries. Attempt saved. Carel Eiting (Netherlands U21) left footed shot from outside the box is saved in the centre of the goal. Assisted by Denzel Dumfries. Substitution, Netherlands U21. Carel Eiting replaces Teun Koopmeiners. Ben Chilwell (England U21) wins a free kick in the defensive half. Foul by Pablo Rosario (Netherlands U21). Corner, Netherlands U21. Conceded by Demarai Gray. Jeremiah St. Juste (Netherlands U21) wins a free kick in the defensive half. Ezri Konsa Ngoyo (England U21) wins a free kick in the defensive half. Foul by Sam Lammers (Netherlands U21). Substitution, England U21. Tom Davies replaces Josh Onomah. Attempt missed. Ryan Sessegnon (England U21) right footed shot from the right side of the six yard box is too high. Assisted by Ben Chilwell with a cross. Substitution, Netherlands U21. Donyell Malen replaces Oussama Idrissi. Attempt blocked. Oussama Idrissi (Netherlands U21) right footed shot from the centre of the box is blocked. Corner, England U21. Conceded by Thomas Ouwejan. Oussama Idrissi (Netherlands U21) is shown the yellow card for a bad foul. Foul by Oussama Idrissi (Netherlands U21). Attempt saved. Thomas Ouwejan (Netherlands U21) left footed shot from outside the box is saved in the centre of the goal.